Hoolock gibbons (genus Hoolock) are a group of very endangered primate species that belong to the small ape family (family Hylobatidae). The entire population that is distributed in the northeast and southeast of Bangladesh is estimated to include only around 350 individuals. A conservation program is thus necessary as soon as possible. Genetic markers are significant tools for planning such programs. In this study, we examined chromosomal characteristics of two western hoolock gibbons that were captured in a Bangladesh forest. During chromosome analysis, we encountered two chromosome variations that were observed for the first time in the wild-born western hoolock gibbons (Hoolock hoolock). The first one was a nonhomologous centromere position in chromosome 8 that was observed in the two examined individuals. The alteration was identical in the two individuals, which were examined by G-band and DAPI-band analyses. Chromosome paint analyses revealed that the difference in the centromere position was due to a single small pericentric inversion. 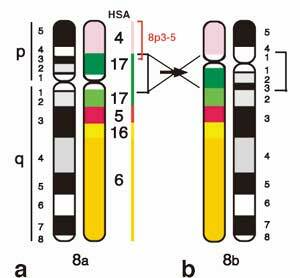 The second variation was a heterozygous elongation in chromosome 9. Analysis by sequential techniques of fluorescence in situ hybridization with 18S rDNA and silver nitrate staining revealed a single and an inverted tandem duplication, respectively, of the nucleolus organizer region in two individuals. These chromosome variations provide useful information for the next steps to consider the evolution and conservation of the hoolock gibbon.